To Sum It Up: Aria has always lived under the dome of Reverie, an enclosed city that protects its Dwellers from the ferocious Aether storms that make life outside of Reverie, and other Pods like it, nearly uninhabitable. When Aria suddenly finds herself expelled from Reverie, she must form an uneasy alliance with an Outsider named Perry if she hopes to survive the harsh environment and find her way back home. As much as he hates to admit it, Perry also needs Aria's help finding someone very close to him who's been taken by Dwellers. Together Aria and Perry journey across the unforgiving landscape in search of a way to recover what they both have lost. Review: I really liked Under the Never Sky. It started off a bit slow because it took me a while to absorb everything about life under the domes and outside of them. Once the action got going, though, I became totally hooked. Rossi deftly switches back and forth between Aria and Perry's points of view, maintaining two unique narrative voices throughout the book. The technique works very effectively here. Aria grows a lot as a character. Having literally lived a sheltered life, it's not surprising that she's rather self-centered and spoiled at the beginning of the book. I never found her intolerably whiny; there's a good balance between Aria being upset over her banishment to the Outside and her doing something about it. She even learns how to fight and defend herself. It's difficult to imagine the Aria that we meet in the opening chapters ever doing that. I loved Perry's storyline, especially his relationship with his nephew, Talon. Perry is a fascinatingly complex character. He wants what's best for his tribe, the Tides, but is powerless to do anything unless he challenges his brother for their leadership. It's Perry's devotion to Talon that makes Perry hesitant to take some kind of action: either to fight his brother or leave the Tides and strike out on his own. I could have read an entire book centered on Perry's life with the Tides because I found it so engrossing. I can't forget to mention Perry's friend Roar, who turns up later in the book. Roar is hilarious and practically steals the limelight; I hope to see much, much more of him in the next book. For me, the heart of Under the Never Sky is the relationship that develops between Aria and Perry. Now, forcing two characters from completely opposite backgrounds to work together could have ended up being a contrived mess, but thankfully, that is completely avoided here. Aria and Perry's realizations that maybe their initial impressions of each other weren't exactly accurate happen at a gradual, and most importantly, believable, pace. Dystopian/post-apocalyptic books are sometimes hit or miss for me, but this one was a definite hit. Under the Never Sky is a very entertaining combination of action, adventure, and romance, with some humor tossed into the mix as well (thank you, Roar). Fans of dystopian novels need to add this to their to-be-read lists for sure. All in All: Despite a few gaps in the world building, this is an excellent read thanks to the engaging characters and spot-on pacing. I'll definitely be reading the sequel. 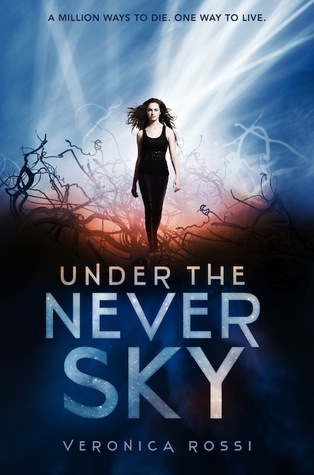 It always thrills me when other reviewers love books I adore - and Under a Never Sky is one of the them. I am so in love with Perry it's almost juvenile! Fantastic, imaginative story. I know what you mean about Perry! Although I enjoyed reading from both his and Aria's perspectives, Perry's chapters were the ones that I looked forward to the most. I wasn't sure how I was going to like this book based on the opening chapters, but then everything fell into place, and I couldn't put the book down.